VMWare unveiled new versions of its desktop virtualization software with support for Windows 10. If you're a Mac user and need access to a PC, you can run Windows 10 in a window on your Mac with VMWare Fusion 8. Unlike Apple's Boot Camp, VMWare runs Windows as a virtual machine, meaning you don't have to dual boot. For PC users, the Workstation 12 software allows you to try out Windows or another operating system alongside your existing OS. PC owners who need access to Windows 10 for work or for development needs but don't want to rely on Windows 10 as their main OS can run Microsoft's latest operating system alongside their main OS. Fusin 8 is VMWare's latest virtualization software for Mac users who want to run Windows 10 on OS X. With support for both Windows 10 and Apple's OS X El Capitan release, Fusion 8 brings Windows features such as Cortana and Microsoft Edge to Macs with powerful hardware support. Like Parallels Desktop 11's Coherence mode, VMWare's Unity view allows Windows programs to run and look like they're native OS X apps. Unity frees Windows apps from the Windows 10 desktop. This allows you to view your Windows programs running on your Mac desktop, rather than seeing window apps inside a Windows 10 window on your OS X desktop. Fusion 8 also supports Retina displays on Macs, like the iMac with 5K Retina display. This allows Windows to show content pixel-for-pixel on a Mac. Additionally, Fusion 8 gives you flexibility on how you configure your virtual machine hardware, with support for up to 16 vCPUs, 64GB RAM and 2GB video memory. You'll have access to accelerated 3D graphics with support for DirectX 10 and OpenGL 3.3 for better performance compared to prior releases of Fusion. Fusion 8 allows users to virtualize OS X as well, allowing users to run Yosemite as their main OS and virtualize El Capitan, for example. Enterprise customers with Mac deployments can take advantage of added features on Fusion 8 Pro, such as faster virtual machine suspend and resume time, improved VoIP support, support for complex virtual networks and vCloud Air to run your virtual machine in the cloud. PC users can virtualize Windows and Linux using VMWare's Workstation 12 Pro or Workstation Player. VMWare is rebranding its prior Workstation release to the Workstation Pro moniker this year, and the previous Player Pro now becomes Workstation Player. Workstation 12 Pro comes with similar support as Fusion 8 for Mac. Both products support Windows 10, but Workstation 12 Pro will not allow you to virtualize OS X on your PC due to Apple's OS licensing restrictions. Workstation 12 Pro supports Windows, Linux and other VMWare virtual machines. VMWare claims support for over 200 operating systems. If you're virtualizing Windows, Workstation 12 Pro offers note-taking capabilities with the Edge browser. VMWare says that Workstation 12 Pro also supports touch, inking and USB 3.0 in the virtual machines. Users can configure their virtual machines to take advantage of up to 16 vCPUs, 64GB RAM, 8TB storage and 2GB video memory. It comes with support for DirectX 10 and OpenGL 3.3, which opens the doors to new Microsoft features, such as the new PowerMap function in Excel. Workstation 12 Pro features up to three times faster suspend and resume time and improved graphics performance. Workstation 12 Player is a more basic version of Workstation 12 Pro. VMWare says that Player is targeted at users who only need to run one or two virtual machines. The software comes without the ability to run as a server and you can't create restricted virtual machines, linked clones or access the virtual network editor. VMWare Fusion 8 is available for $79, and Fusion 8 Pro retails for $199. Users upgrading from Fusion 7 to Fusion 8 can pay the $49 upgrade price, and those upgrading from Fusion 7 Pro to Fusion 8 Pro can pay $119. The upgrade fee to migrate from Fusion 8 to Fusion 8 Pro is $119. 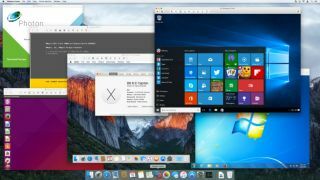 VMWare highlights that one of the big differences between its Fusion 8 software and the rival Parallels Desktop 11 virtualization software is that Fusion 8 runs on a per-user licensing basis whereas Parallels charges per system. This means that if you own three Macs, you can use the same Fusion license on all three Apple computers. Workstation 12 Player costs $149 or $79 if upgrading from Player 6 7, while Workstation 12 Pro costs $249 or $149 for users upgrading from Workstation 10, Workstation 11, Player 6 or Player 7. To upgrade from Workstation 12 Player to Workstation 12 Pro, users must pay the $99 upgrade fee. If you're planning on running Windows 10 in a virtual machine, you'll also need to purchase a license from Microsoft. Fusion 8 Pro and Workstation 12 Pro customers will also get $600 in vCloud Air credit for six months.